Given that this is the third book in a series, I’m not going to put a synopsis here. It might spoil earlier books, and I’ve enjoyed this quirky fantasy-mystery series too much to possibly spoil it for others. 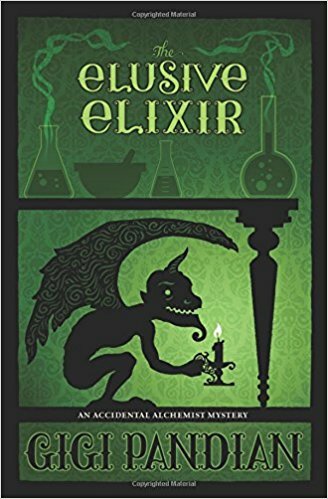 In general, this series is about an alchemist who accidentally discovered the elixir of life a couple hundred years ago. She is trying to start a “new” life in Portland, but “normal” is complicated by dead bodies – this is a mystery series! – and a living stone gargoyle who also happens to be a master chef. This series is a lot of fun, and the third book is no exception. Honestly, I’m not sure if the series will continue after this volume. It could, as many cozy mysteries do, but one of the major plot-arcs has concluded. There were a few loose ends that could easily evolve into the next plot-arc, but can also simply be left as loose ends at the conclusion of the series (they aren’t central to the plot). I can see this going either way. Regardless, this trilogy-so-far has been awesome, and the conclusion of the primary arc was excellent. I highly recommend it as a light, quirky, cross-genre blend with an excellent audio narrator (Julia Motyka). This entry was posted in 2017, Adult, Prose and tagged audio, humor, mini-review, speculative. Bookmark the permalink. Sounds fun! Apparently she has another series, too. Have you read it? I haven’t but I definitely want to look into it!